Rugs are a part of interior decorating that don't get a lot of thought, but are more important to the tone of a room than you'd think. While it's hard to notice if a rug has been chosen correctly, it's easy to notice when a rug is wrong for the space. So how does a layman decide which size and type of rug is best for where they live? Follow a few simple tips to make the job easier. First thing is first, sit down and decide what exactly you want your rug to do, and what space it will work in. Is it supposed to define the focal point of a large room? Provide atmosphere with a burst of colour? Which colour works best in the room? Size matters particularly in this case, measure your space and decide on how much of it you want the rug to fill before you start. Consider all the factors, for example a dining room rug must be allow for the chairs to be pulled out without damaging the edges or catching and causing irritation. Do some thought before you even step foot in your local Rugs A Million to browse your options. If you're working with a smaller space then it is wise to consider the type of tones you want. If you want the room to seem more spacious then a light soft neutral tone will accomplish that goal. 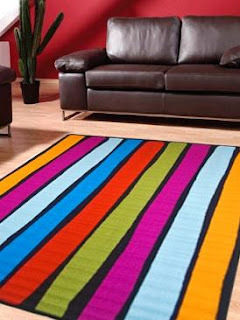 However if you want to the rug to make the room seem cosy then a deeper colour is important. In a larger space then a bold defined colour can break up the space and show a centrepiece while neutral tones make the space seem open and free. What tone do you want your room to have? This is important particularly in choosing the rugs size. A large rug topped with furniture gives a casual air to the space while a small rug in the centre of the room surrounded by furniture gives a polished, formal atmosphere that is good for entertaining guests. Patterned rugs will make the room feel more unified, as it will anchor the colour scheme if chosen correctly. Colour matching is a pain for anyone. It may be tempting to go with a simple black or white to match any colour and that is a good choice, however accenting a colour that exists in a small way in the room, for example the dominant colour in a painting on the wall, can draw the eye to an item that you're proud of. If you want to go the easy way, match or compliment the dominant colours of the room. The rug can often provide a finishing touch to a space that makes it feel lived in, elegant, homey or natural and picking the right rug for your feel is important. Sit down, figure out what you want, and don't settle for anything less.